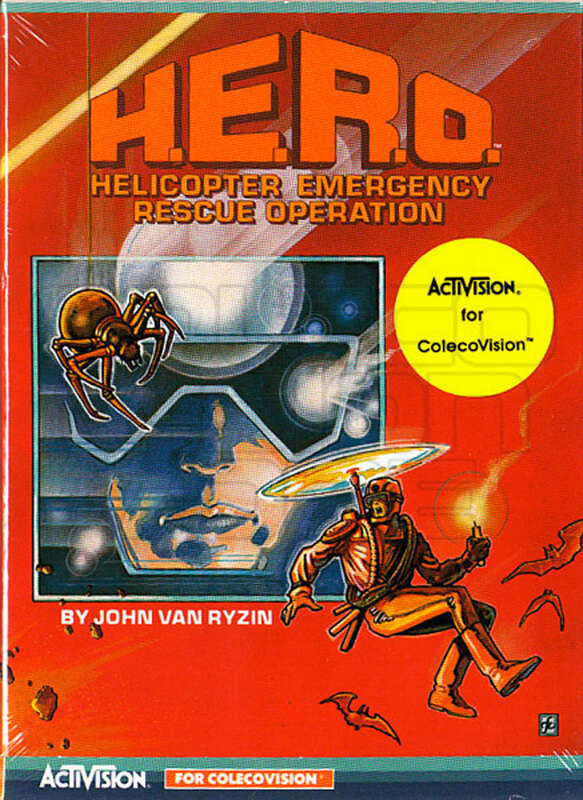 Hero, as it is commonly referred to, is a fantastic Atari 2600 game from Activision that was ported to many home consoles and computers. As it made it's way to more sophisticated platforms, it's graphics were greatly improved, but the control on the 2600 was hard to beat. As the scenery was improved, it sometimes became harder to navigate the vertical mine shafts as they lost their straight aligned walls. This is a terrific game regardless of the platform. Seek a copy and you will be a happy gamer. Miners working in Mount Leone are trapped, and it's up to Roderick to reach them trapped miles under the surface of the earth! Use the Prop-pack to maneuver through a maze of mine shafts! Blast vile vermin with the Microlaser Beam! Dynamite walls! Negotiate across the lethal lava flow! Rescue all the miners you can before running out of lives or power! You are Roderick Hero and your quest begins with 4 lives and six sticks of Dynamite. Sounds like you'll be ready for anything as long as you don't touch any vertical walls and move away from the Dynamite once deployed. If you survive, you'll gain extra lives every 20,000 points. You play H.E.R.O. as Roderick Hero (sometimes styled as "R. Hero", as in "our hero"). The original game was created by John Van Ryzin. The game's popularity led to it's inclusion several compilations of Activision games including Activision Anthology. When Sega ported the game for its Japanese SG-1000 console in 1985, they changed the backpack from the familiar helicopter to a jetpack. Your helicopter backpack allows flight and hovering. You'll discover that the game's gravity will whisk you away from level to level if you don't engage in some hovering to slow you down. A tap forward on your controller will put you in a hovering mode. Don't dally as this expends your energy. In fact all your resources are finite and valuable. The less you use, the more points you can redeem when you reach the next miner. As you progress along, you'll discover success comes to those who conserve resources. There are 5 game variations to choose from that will enable you to begin at higher levels once you become proficient with rescuing miners. Once you pass level 17, the highest level you can begin from, there are no more numbered levels and the terrain will appear randomly. As with many Activision titles, scoring 70,000 points or more lets you join the "Order of the H.E.R.O."! I'm sure some of you still have your patches as proof of your accomplishment. is a great game on virtually any platform. The Colecovision version is one of the earliest consoles to expand it's graphics beyond the Atari 2600's capacity. A beautiful and fun game.